There’s something quite alluring about the peculiar pedals coming from the Canadian husband and wife duo collectively known as Dr. Scientist. Their guitar pedals are hand-made from the highest quality components, are superbly functional, and are simply stunning to behold. The Dr. Scientist Frazz Dazzler is no exception. It’s a modern take on a Silicon-based fuzz with several enhancements such as soft touch switching, a Mix control, and dual gain modes, resulting in quite an interesting little fuzz box. It’s always refreshing to see companies putting a modern spin on classic designs, and the Frazz Dazzler looks like it has a lot going for it. Is it the best fuzz distortion pedal around? We’ll blast off in space to find out, but first let’s run down the features before we proceed to our in-depth Dr. 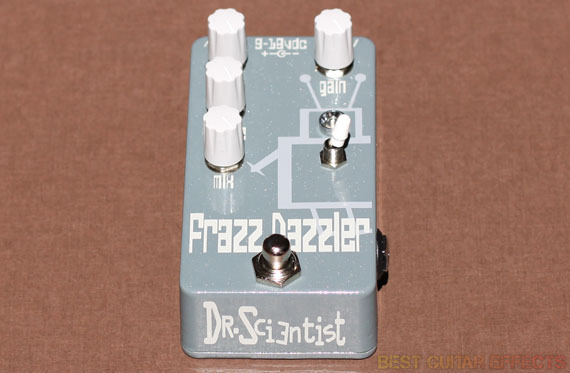 Scientist Frazz Dazzler review. Gain knob controls the amount of distortion imposed upon your signal. Sizzle knob controls the amount of treble content on the wet signal. Volume knob controls the level of the wet signal. Mix knob blends between your dry/clean signal and the wet/distorted signal. Toggle switch adjusts between 2 fuzz gain settings: low/medium gain and medium/high gain with gating effect. Internal trim pot adjusts bass response +/- 15dB at 100Hz. True Bypass using soft touch switch and relay. Visit Dr. Scientist for more info about the Frazz Dazzler. I went for the Strat as per usual when testing a fuzz pedal for the first time. I dialed in a flat, clean amp tone and set the knobs on the Frazz Dazzler to noon with the exception of the Mix control which I rolled clockwise for a 100% wet sound. Upon activating the Frazz Dazzler, it becomes immediately apparent that this pedal has a very refined and modern fuzz tone. Translation: this pedal totally rocks and produces wicked fuzzy overdrive sounds with ease. The Frazz Dazzler has a full, thick sound that packs plenty of punch and authority while remaining tight and focused. The Frazz Dazzler also cleans up very well with a subtle twist of your guitar’s volume knob. It’s remarkably dynamic and expressive. There’s enough versatility here for full-on rock power chords and tasteful lead playing. The sensitivity of the Frazz Dazzler to your playing dynamics makes this pedal very conducive to those moments when inspiration strikes and your music is suddenly taken in a different direction. The Sizzle knob is very useful for shaping your tone by allowing you to dial in your preferred top-end response. You can roll it fully clockwise for some full-range tones or back off a bit to darken your sound for some warm vintage-like flavor. I like it maxed out for a full top-end that compliments the full bass response of the pedal. It has a very vintage, yet modern tone that is classic and cutting edge at the same time. Flipping the Toggle-switch brings in a higher dose of gain for you fuzz extremists out there. It has a massive tone that is absolutely crushing. If the low-end is too extreme for you, you can use the internal trim pot to cut it back a bit. The Frazz Dazzler also allows you to boost the bass to punish your audience with a massive low-end onslaught. The Frazz Dazzler’s higher gain mode also benefits from a built-in gate function which will keep this apocalyptic robot of doom from running rampant. It’s certainly one of the more intense fuzz pedals out there. Another intriguing feature of the Frazz Dazzler is the Mix control which allows you to blend the dry and wet signals to taste. This is useful for adding in some clean dry tone to your fuzz for extra clarity. You can also use an expression pedal to fade the fuzz in and out of your signal, a very useful option for those who like to get creative with their distorted textures. The Mix knob also makes this pedal a great choice for use with bass as you can preserve your low-end and still have plenty of fuzz present in your overall sound. The Frazz Dazzler even works well when stacked with with other pedals. I used the Frazz Dazzler in conjunction with Dr. Scientist’s The Elements for distortion and EQ and achieved plenty of great sounding tones. It’s definitely worth trying with your favorite dirt pedals or in front of an overdriven amp. The Dr. Scientist Frazz Dazzler is a space-age fuzz of intergalactic proportions. It can do higher gain fuzz and still clean up well with a twist of your guitar’s volume knob. If you want more extreme fuzz, flick the gain switch and enjoy the gated fuzz chaos that ensues. Guitarists and bassists alike will enjoy the ability to blend in your dry tone via the Mix control for fuzz sounds with added clarity. All in all, if you’re looking for the best fuzz distortion pedal around, the Dr. 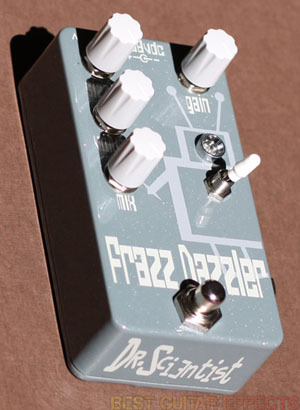 Scientist Frazz Dazzler may be just the pedal to fit your needs. That concludes our Dr. 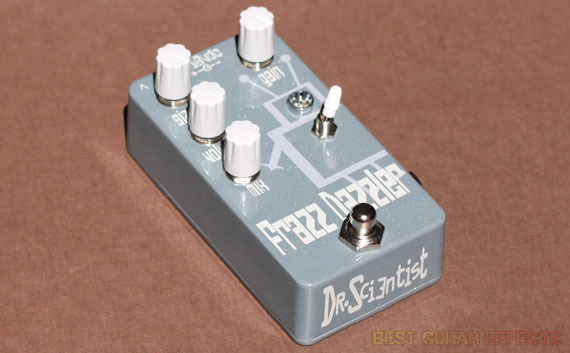 Scientist Frazz Dazzler review. Thanks for reading. Want to buy the Dr. Scientist Frazz Dazzler?